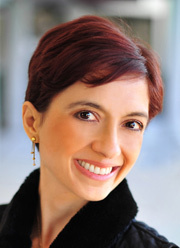 Farnoosh Brock is a writer, speaker, and business coach. She started her own company, Prolific Living, after her corporate career to become a full-time entrepreneur and world traveler. Farnoosh advocates holistic healing through green juicing, healthy smoothies, positive mindset, and yoga. She also works with aspiring entrepreneurs on how to leave employment, find their passion, and start their own businesses.